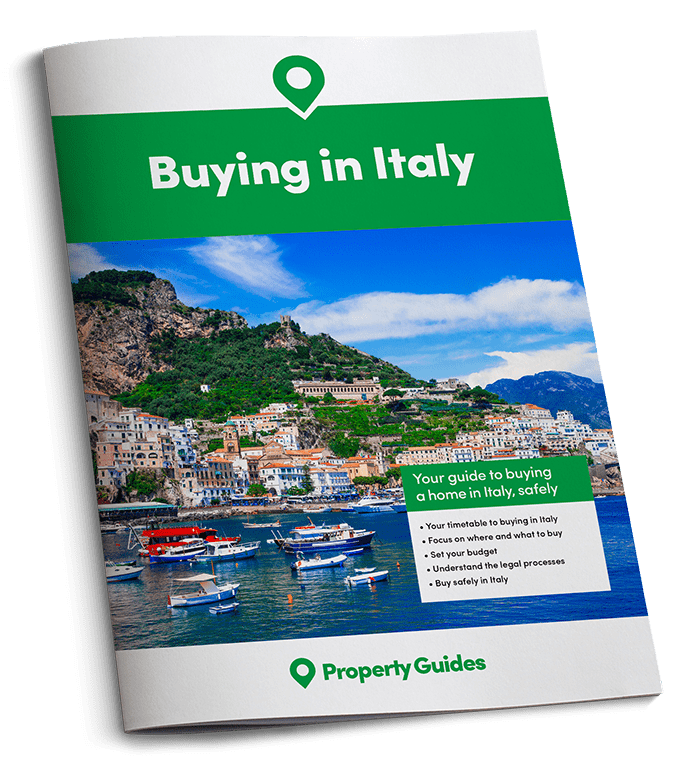 Many house buyers have already discovered that there is more to Italy than just Tuscany. By spreading their search out a little, they have got more house for their money. While still enjoy amazing views of medieval villages, rolling hills, vineyards and mountains. Umbria is known as ‘The Green Heart of Italy’ and consists of only two provinces, Perugia and Terni. Rich in history, art and religious heritage, many famous saints come from Umbria including St. Francesco of Assisi. Umbria’s economy is mainly based on agriculture and industry. So along with tourism these are the areas offering the most work opportunities. Umbria is known as ‘The Green Heart of Italy’. There are many medieval hill top towns and endless green fields with vineyards, olive groves, woods, lakes, rivers and mountains. Many of these hilltop villages are listed among the most beautiful in Italy, offering great views. Lots of information can be found about twenty six of the most beautiful Umbrian villages on the “borghi più belli d’Italia” website. You can live a healthy lifestyle here and enjoy good home cooking using locally grown produce, such as grains, vegetables, truffles, cheese, herbs and olive oil. Le Marche is the real authentic Italy. A region rich in history, customs, local products and traditional country food. Cultural highlights are found primarily in towns like Urbino, Ascoli Piceno, Macerata, Loreto, Jesi and the regions capital Ancona. The Adriatic coastline in Le Marche has some lovely bays, fashionable resorts and golden sands. But, most foreign buyers head inland. 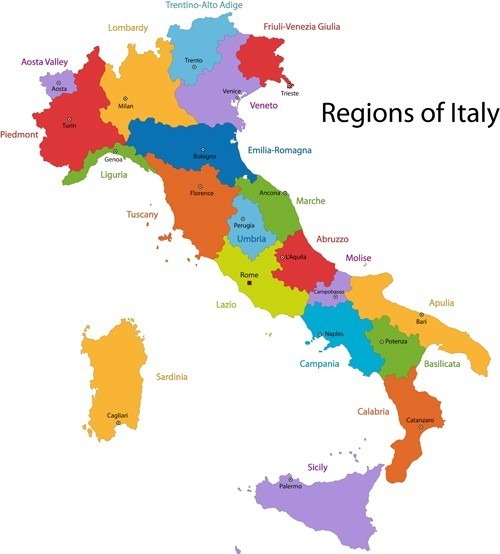 To the west, the region borders with the Appennine mountains and Umbria. Winter sports can be enjoyed at Monte Sibillini and the Frasassi Caves are very popular with tourists. Between the Appennines and the Adriatic coast is a beautiful hilly landscape with traditional farmhouses surrounded by vineyards, olive groves, sunflowers and cereals. These farm buildings can be bought at very reasonable prices, as many young people are now more interested in making their living in the cities and coastal resorts. These farms are now beginning to offer tourist accommodation and activity holidays as an alternative income, including cooking schools and wine tours. Le Marche is the real authentic Italy. There are many beautiful old villages where time has stood still. 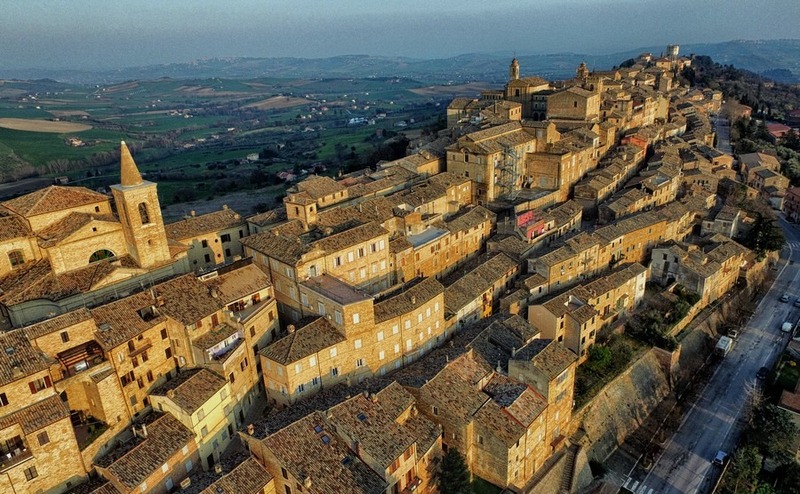 The Touring Club Italiano has awarded twenty one of its prestigious “Orange Flag” awards to Marche towns ( Acquaviva Picena, Camerino, Corinaldo, Frontino, Genga, Gradara, Mercatello sul Metauro, Mondavio, Montecassiano, Montelupone, Monterubbiano, Offagna, Ostra, Ripatransone, San Ginesio, Sarnano, Serra San Quirico, Staffolo, Urbisaglia, Valfornace, Visso). This award is only given to small inland communities that offer a quality experience to tourists, without sacrificing the environment. The online guide of the “21 Orange Flags” highlights what each village has to offer. Umbria has a regional airport, the Aeroporto Perugia, “San Francesco d’Assisi”, located midway between Perugia and Assisi. 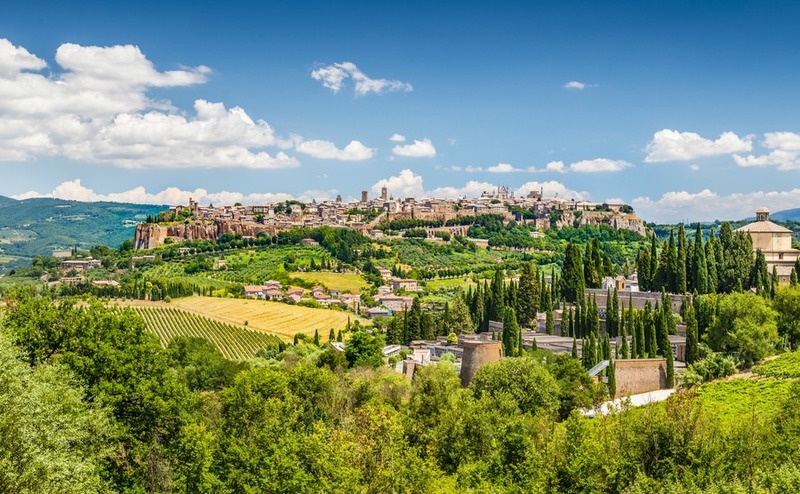 Ryanair flies year-round from Stansted to Perugia (Umbria) and Ancona (Marche). The north of the region can also be reached via Florence airport which has good rail and road links into Umbria. British Airways fly from London City airport and Vueling from Gatwick. Some towns like Orvieto are on the Florence to Rome railway line, making Rome airport another option for residence in south west Umbria. Some towns can also be reached by the Florence to Ancona rail line or small scenic branch lines. The port of Ancona runs ferries to Greece, Croatia and Albania and a railway line runs along the coast, making it easy to visit the region’s seaside resorts. Inland, you will mostly need to travel by car or bus. There is a medium to high chance of feeling an earthquake in these two regions. But those house buyers that have visited here and fallen in love with the place don’t appear to be put off. Even, Ed Sheeran, who quite frankly could afford to buy a property anywhere in the world, has bought a villa near Paciano in Umbria, near Lake Trasimeno. He told Italian press that he felt a tremor while he was there. But he also added that it was “an ideal place to raise my children when I have them”. The highest risk area is the south eastern quarter of Umbria and crossing over the border at this point into south west Marche. The chance of seismic activity gets lower on the western half of Umbria and particularly around Amelia, Orvieto and Narni. Along the coastline of Marche is also considered safer. If you do a major renovation, it is obligatory to incorporate seismic reinforcements to buildings. Old houses that were built before stricter building regulations came into effect should have a “seismic vulnerability analysis” carried out to assess what can be done to improve the seismic resistance of the building. This might include tie-rods and other supports. Umbrian and Le Marche properties represent excellent value for money. In Umbria prices get lower in the southern areas of Terni, Narni, Amelia, Spoleto and Norcia and there are a number of properties needing renovation. In the more remote central villages you can still find houses costing less than €100,000, and they tend to be stone built with loads of character and spectacular views. There are even townhouses with impressive frescoes on the ceilings and beautiful stone fireplaces. In the countryside you’ll find large farm houses with outbuildings, needing total renovation, starting from around €150,000. To see what is available visit Rightmove Overeseas, Umbria. Umbrian and Le Marche properties represent excellent value for money. In Le Marche the coast is usually the most expensive place to buy. Prices tend to drop steadily the further you move inland, reaching their lowest levels in the mountains. If you follow one of the roads inland from the coast and explore either side of that, you will get much more house for your money and still be a straightforward drive from the sea and airport. Macerata, Amandola, Sarnano and Ascoli Piceno have already attracted the attention of foreign buyers. There are countryside houses to restore for under €100,000, but €210,000 could get you a three-bedroom house ready to move in and for €290,000 you can find five-bed houses with a pool. See just how much you can get for your budget on Rightmove Overseas, Le Marche.